Before you go to the black market to buy antibiotics and a kidney for Uncle Earl, there are somethings that you should know. One: Kidneys are hard to get past the TWA. They like to collect them. It's a hobby. Two: Not all antibiotics are created equal. Even the Founding Fathers, Martin Luther King, and Bugs Bunny would agree. Some antibiotics cover bacteria that cause upper respiratory infections, while others treat bladder infections and entercolitis. Some treat sore throats and some treat STDs. But none of them treat viruses. You see there is some old school thought that antibiotics are superheroes that fight crime, leap tall buildings in a single bound, and cure the common cold. Not going to happen. Penicillin won't stop H1N1. The Z-pack won't stop a bullet. And Ciprofloxacin won't bring your ex back. Not going to happen. Antibiotics have their limitations. So for the next few posts, I'm going to talk in depth about the different classes of antibiotics and what they are best used for. 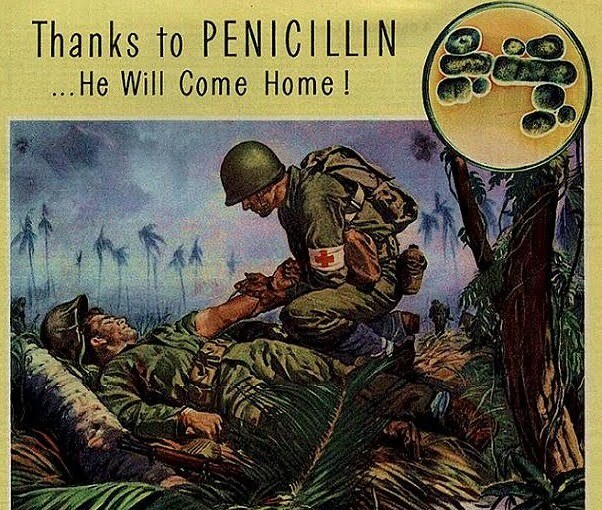 The first class of drugs are called the penicillin family. 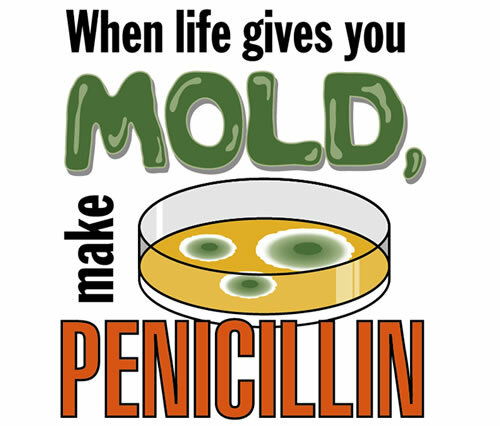 Penicillin was discovered when a scientist left his moldy sandwich close to a petri dish filled with nasty bacteria. Seriously, who does that? Who leaves their sandwich next to a growing pile of killer bacteria? What was he trying to do? Save it for later? Yum. Anyway, the mold on the sandwich annihilated the bad bacteria because it was the freakishly powerful penicillin. Bwahahaha! Thereafter, penicillins have saved millions of lives over the years, especially during the World Wars. So kudos to that perky mold sandwich, it saved the day. Personally, I have a love-hate relationship with these antibiotics. Penicillins love to give me a rash the size of Kansas. And I hate the swollen tongue and gasping for breath that comes afterwards. Every class of antibiotics has a chance of causing an allergic reaction: we can't necessarily play favorities. But I do want to mention here the cross-reactions between penicillin allergies and those to certain other classes of antibiotics. As much fun as it is to watch a patient balloon up after administering a drug, we doctors don't like doing it. So we try to avoid giving penicillins to people whom have already demonstrated allergic reactions to cephalosporins and carbapenems. And vice versa due to cross-reactivity between these classes. Cephalosporins and carbapenems will be discussed in later posts. Penicillins are beta-lactams. What does that mean for us? Diddly squat. That's a scientific term that I would rather put a red-hot poker through my eye than explain. But what we can take away from this is that the penicillin class of beta-lactams has some serious weaknesses. Let's put it this way. Bugs are smart. The mutated little beastards have figured out a way to kick the living snot out of penicillin beta-lactams, rendering them less effective against certain super chains of bugs. Freakish beastards. And you're thinking, darn I left my microscope in my other camping jacket... so can you just tell me what conditions I can use the blasted drugs for. Amoxicillin is the pediatrician's favorite drug for otitis media or ear infections. It is also the first line choice for Strep throat and prevention of bacterial endocarditis in patients with heart valves undergoing dental work. It can be used in anthrax treatment and prophylaxis. This drug has all but replaced penicillin in a lot of conditions. This drug has beautiful gram positive coverage and some gram negative coverage. This is your urinary tract infection drug, because it goes all WWF smackdown on Escheria coli. It also is the drug of choice for listeria meningitis. Ampicillin is one of the few penicillins that can cross the blood brain barrier. If you have a resistant case of meningitis in an immunocompromised patient, especially if he/she is an infant less than one month of age, give them ampicillin. Unasyn is a more aggressive form of Ampicillin with more coverage of bugs such as Serratia, Enterobacter, Pseudomonas (swimmers ear and wound infections in burn victims), and Legionella (air conditioner related pneumonia in elderly). It's general indications are for gynecological, intestinal, and skin infections. 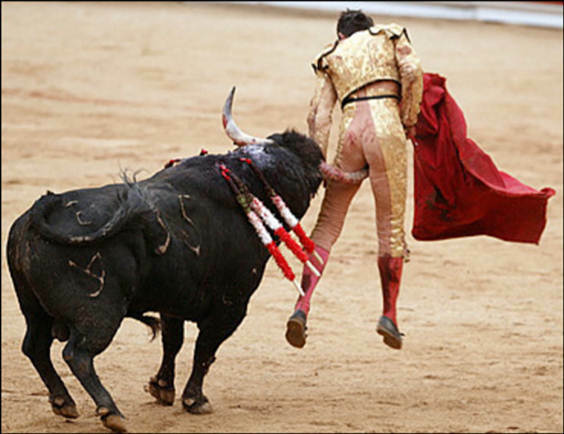 Oxacillin: This one's fun, because it's named after a bull and can seriously kick bacteria bum. Oxacillin treats recurrent Group B Strep (GBS) infections and is great for pregnant women when ampicillin doesn't work and for neonates suffering from GBS infections. GBS is transmitted through the vaginal canal during delivery to the infant. If there is a vaginal delivery at home, the chances are that the baby is going to acquire a GBS infection and could die. GBS infection signs of fever, lethargy, grunting, nasal flaring, pale or blue appearance, and difficulty feeding occur mostly within the first 24 hours but can occur up to 6 days of life. Note: Oxacillin can only be administered via intramuscular injection or intravenously. Neonate doses are approximately 50mg/kg/day every 12 hours. Timentin: A combination drug (Ticarcillin + clavulanate), Timentin is similar to Augmentin but doesn't cover Legionella. Yet, it covers Clostridium difficile, which is the most foul-smelling diarrhea you will ever smell. It makes Giardiasis smell like roses. Consider it a kind of Post-traumatic Stress Disorder for your nose, because if you smell C. diff once, then you will never mistake it again. C. diff is the diarrhea most common in hospitalized patients which are already on enough antibiotics to kill an elephant. The most common antibiotic associated with acquiring C. diff is Clindamycin. So if you have a patient that was given Clindamycin and afterwards, suddenly gets the Great Stink of all diarrhea then you pretty much can guess it is C. diff. Treat them with Timentin or oral vancomycin and be done with the juicy squirts. Zosyn: The brand name for piperacillin + tazobactam, Zosyn has the same coverage of the aforementioned penicillins, but with increased ability against Pseudomonas. This drug should be used in conjunction with an aminoglycoside to cover severe pseudomonas infections in burn victims. You can tell a pseudomonas infection by its characteristic blue-green color it causes in wound tissue and the sweet grape-like scent. Okay, who was the guy that said, "Mmm! I so want to sniff that wound. I bet it smells like grapes." Well, I hope you enjoyed my ode to penicillins.